Transform that ordinary grilled poultry into a juicy explosion of smoky-sweet savoriness that you had never before imagined could possible; say goodbye to dry and chewy thighs and breasts that require a gulp of water just to get down your gullet. Just mix the seasoning with water, inject into a few different spots, and be amazed as every single bite practically drips with the flavors of garlic, onion, brown sugar and our signature smoked secret-spice blend. If you take your meat seriously, then it's time you seriously considered taking your chicken to the next level. 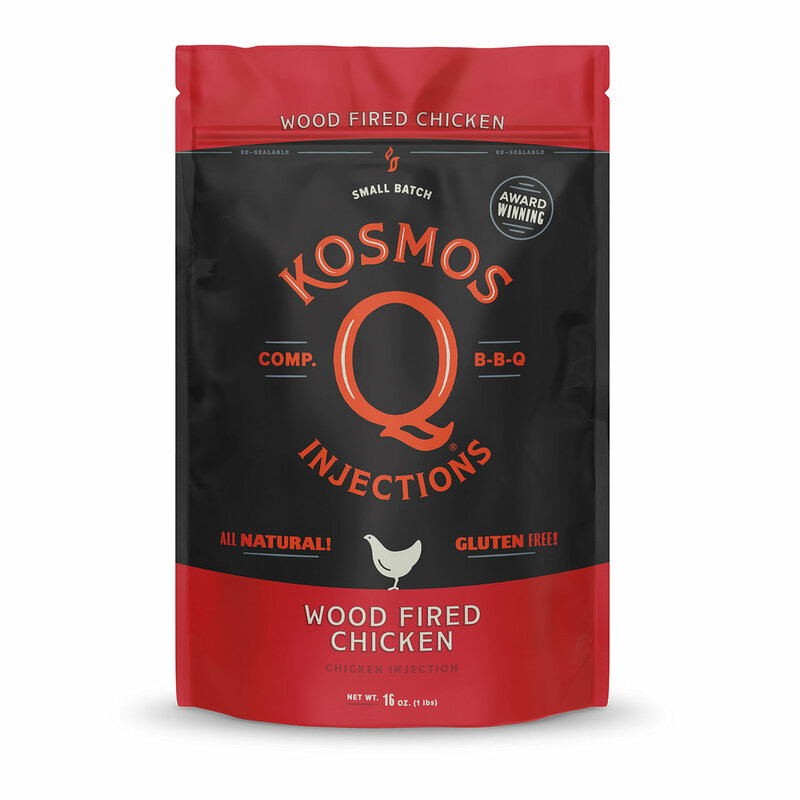 For a taste that needs no correction, there's only Kosmo Q's Wood Fire Injection! Enough for 5 lb. Chicken. 1/3 Cup of Seasoning (45g) to 2 cups liquid (chicken broth, distilled water, or whatever liquid you prefer). Adjust to personal taste as needed. (Enough for 5 lb. Poultry). Ingredients: Brown Sugar, Salt, Sodium Phosphate (15.83%), Dextrose, Modified Corn Starch, Aytolyzed Yeast, Yeast Extract, Yeast Extract, Spices, Natural Flavors (Including Smoke & Dairy), Onion & Garlic Powder, Disodium Inosinate & Disodium Guanylate, Xanthan Gum, Honey, Than 2% Silicon Dioxide Added To Prevent Caking. CONTAINS: Milk.